A weekly newspaper which was first printed in 1859 has published its final edition as a ‘newspaper war’ claimed its second casualty. 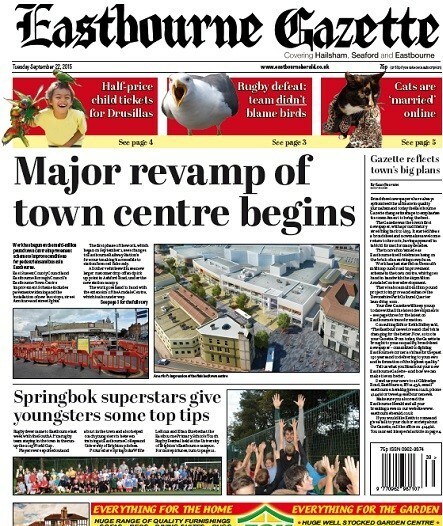 The Eastbourne Gazette was relaunched as a broadsheet in September 2015 as part of a press war in the seaside town between its owner Johnston Press and rival publisher Newsquest. It followed Newsquest’s launch of a new free title, the Eastbourne Independent, under former Gazette editor Peter Lindsey. The Independent closed in April, 11 months after launch, and now the Gazette has followed suit. The first edition of the new-look broadsheet Gazette following last year’s relaunch. No editorial jobs have been lost as a result of the closure which was announced on the front page of this week’s final issue. The Gazette will now be folded into JP’s other Eastbourne title, paid-for weekly the Eastbourne Herald. The announcement read: “This will be the last printed edition of the Eastbourne Gazette. From next week it will be incorporated into our popular and hugely respected sister title the Eastbourne Herald. “In an internet and social media age producing the mid-week Gazette no longer makes sense for most readers. They prefer to obtain all their breaking news as it happens on our website www.eastbourneherald.co.uk with updates across Facebook and Twitter. “Our Friday Herald contains the very best and most comprehensive printed version of all the week’s news, views and analysis. “By bringing the Gazette into the Herald it means our journalists can spend even more time researching the news you want to read about – and presenting it on the most popular digital and print arenas. It will make the content in the Herald and on our website better and stronger. “We are committed to Eastbourne. We are here to campaign on your behalf. To report the news as it happens. To be a force for good within the community. We ask the difficult questions of decision-makers and support those trying to make Eastbourne even better. The closure appears to signal the end of the battle for supremacy in the East Sussex resort, with the Herald now the only remaining title based in the town. Newsquest’s decision to launch into Eastbourne followed JP’s acquisition of the Brighton & Hove Independent, which competes with Brighton daily The Argus. Had the Gazette become entirely free distribution. I could never find it in newsagents when visiting Eastbourne – and knew of only one place where there was a bin for picking up copies. I suspect that the relaunch as a broadsheet was a bit of a last-ditch attempt at survival as I think it coincided with creating separate editions of the Eastbourne Herald for Seaford and for Hailsham, while the three previously-separate editions of the Gazette were turned into the single broadsheet. The inside pages of the Gazette were well-designed, and it felt good to have the now rare experience of reading local news in a broadsheet. Everything Johnston Press touches turns to dust.